The book that you just opened is exceptional, as it takes both academic- and social- and organizational reality as its basis. It is my job to guide you to the quickest road to apprehend the mere added value of this most remarkable and respectable book. In two words: this book is both wayward and charming; It will seduce you to look afresh to the outskirt intersections of ethnography, social psychology, epistemology, ergonomics, and each of its application domains as well. This hybridity implies that there is no obligate leading theme; each perspective potentially may take the lead and change earlier paradigms. May it be an adventure to you like it was for me; The outcome, in terms of conceptual swivel, has not been fixed by its authors. This book needs you for finding out its final impact; Each reader faces a new challenge to find a new cognitive balance. This book leads you out of your comfort zone and helps you to find it back as well. Its main message is that theory needs to follow evidence rather than the other way around. My mission is to lead you via short synopses to a metaperspective, even if you don not feel it as such. KOMMERS, Piet. Foreword: The Book's Introduction. 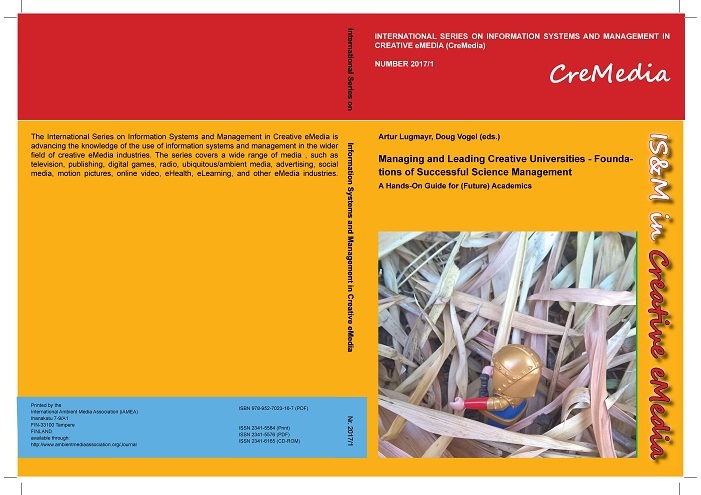 International SERIES on Information Systems and Management in Creative eMedia (CreMedia), [S.l. ], n. 2017/1, p. xi-xiv, dec. 2017. ISSN 2341-5576. Available at: <http://www.ambientmediaassociation.org/Journal/index.php/series/article/view/271>. Date accessed: 23 apr. 2019.